The month of July took one look at our calendar, looked at us, and laughed. It mocked us. It studied everything we had planned, and then it said, Ha! Plans, schmanz… I got something else for ya! In my case, the “something else” included a doozy of a summer cold. But I have no complaints. It was still a fun month. It’s just that very little happened according to plan, and, well, we all know how I feel about plans. I can be a little neurotic about sticking to them. Partnering up with Callaghan has been a healthy balm for that tendency… he’s my opposite in many ways, and there’s nothing like living with your opposite to get you out of your comfort zones! We only caught two of the six live music performances we’d planned to attend, with one of those no-shows being due to my cold. Also because of the cold virus, I couldn’t really hang out with our friends who were here for a few days, visiting from France. And finally, the entire month was consumed by our unexpected plunge into an overwhelming exciting adventure of the nail-biting variety, which I’ll likely talk about in a near-future blog post. “Near-future,” as in, when it’s reached its successful conclusion (fingers crossed)! 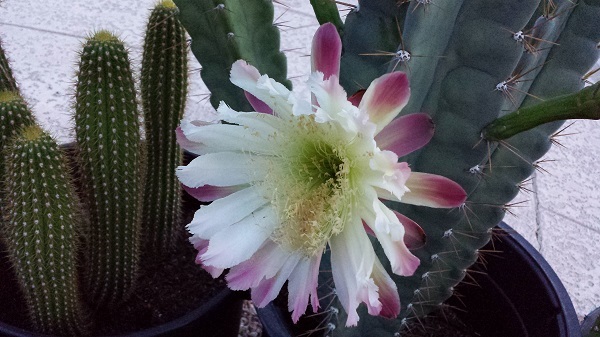 Absolutely captivating night-blooming cactus flower! Virgil across the way cultivates what’s probably the most diverse cactus garden outside of the Desert Botanical Gardens. The day he told us about this particular night-blooming cactus in his collection, we schemed to capture her in action. We went out there at 5:00am the next morning, and again at 6:00am, and again at 7:00am, and we got to enjoy her splendor at each stage. I’ve always loved desert blooms, but this one flower stole the entire 20+-year show! It was especially fun to find an ecstatic bee rolling around in her depths, covered so thickly in pollen that it looked like he was wearing a bright yellow fuzzy coat. Songzaa – my current favorite app for finding new music. This free app magically cranks out playlists according to your mood or whim of the moment… you key something in, and it presents all the possibilities. 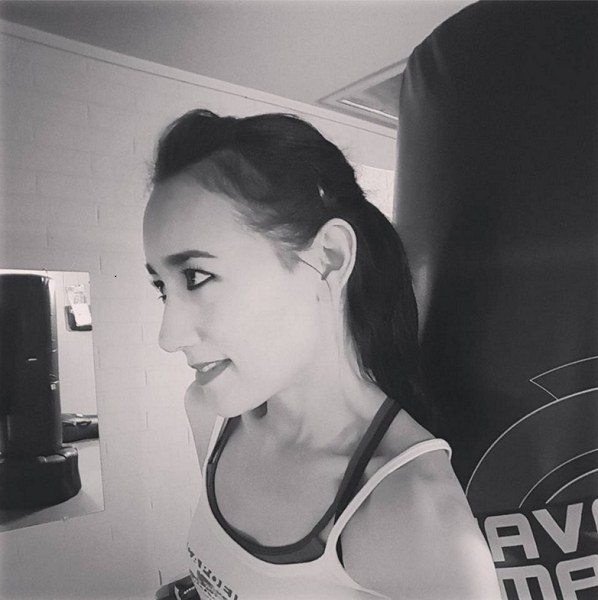 Since I started listening to Songzaa’s playlists, I’ve discovered lots of new music, and that’s always a plus when you have no idea what’s out there and you don’t have time to investigate for yourself. 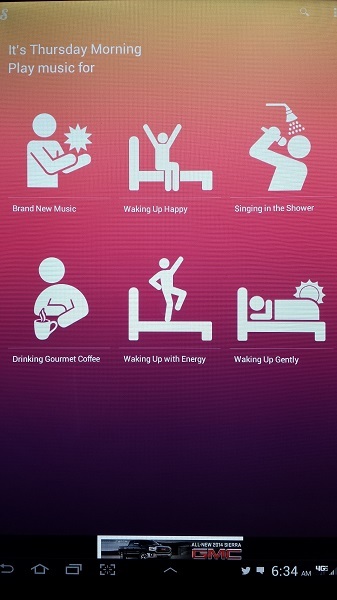 You can find playlists by keying in your mood, a specific scenario (i.e. “cleaning the house” or “road trip”), or specific artists. However you search, it pulls up a list of artists followed by a selection of playlists. What’s not to love? 3). 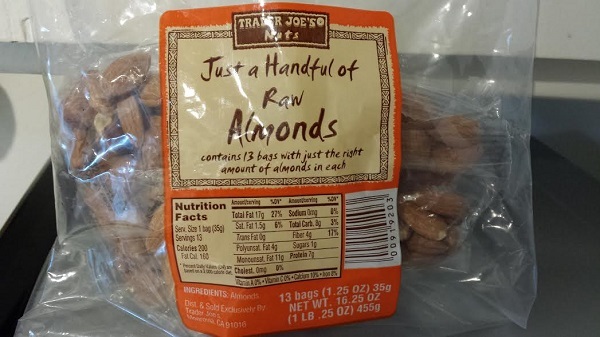 Trader Joe’s “just a handful” of raw almonds. So healthy! So convenient! I throw one of these in my bag as I’m running out the door in the morning, and it saves me when my mid/late morning slump hits… we eat breakfast at 7:00am, so I’m hungry again by 10:30am. This pre-portioned bag of almonds gets me through with the protein and healthy fat it contains, and you’re never going to hear me complain about eating foods rich in Vitamin E, either (it’s so good for the skin)! 4). 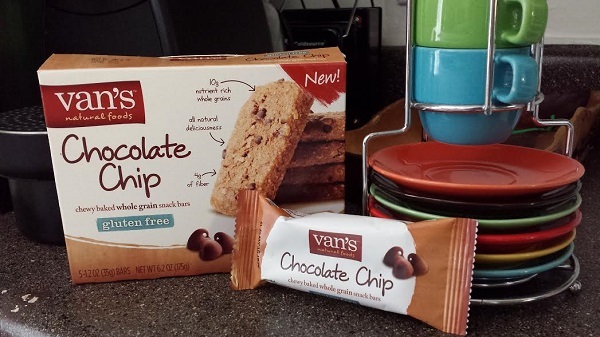 Van’s Natural Foods Chocolate Chip Chewy Baked Whole Grain Snack Bar. My latest favorite energy bar. There’s nothing unhealthy in these all-natural bars. They’re vegan (if that matters to you), gluten-free (if that matters to you), they’re free of GMOs and corn (if that matters to you), they’re kosher (if that matters to you), and they’re whole grain, fiber-rich and free of artificial colors and flavors… not to mention, they’re amazingly good! These bars are just tasty and satisfying to nosh when you need a little something to get you through that annoying, stomach-growling 4:00-5:00pm hour. 5). 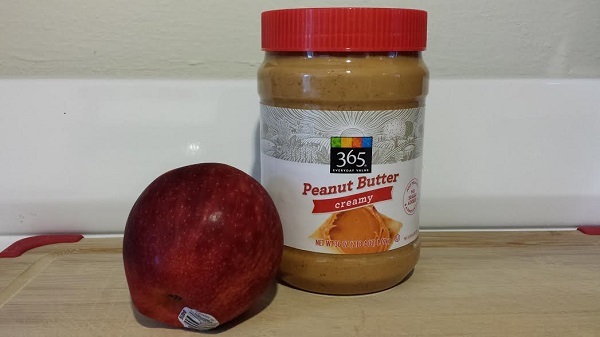 Apples with peanut butter. I’ve been on a serious peanut butter and organic apple kick lately! I’ve always enjoyed this classic combination, but lately, I’ve been really craving it. I cut the apple into wedges and smear them with peanut butter, and the whole experience of eating them is so intensely satisfying, it’s borderline weird. But I’m going with it, because it’s a delicious and ridiculously healthy combination. We finally saw this movie, and it totally cracked us up! It was a riot, and we weren’t expecting to find it as funny as we did. 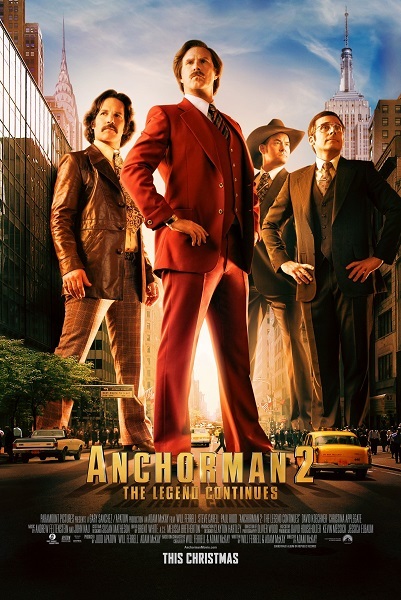 We actually thought it was funnier than the first one, which doesn’t often happen with sequels. 7). St. Ives Lotion Spray in Soothing Oatmeal & Shea Butter. 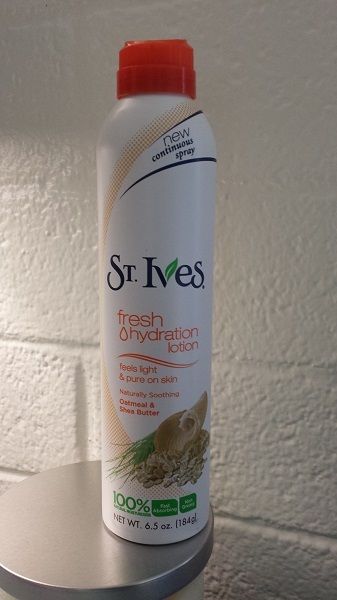 St. Ives made a spray-on lotion, and it’s lovely. St. Ives – I’ve always loved this brand. Now they’ve come out with their take on spray-on moisturizer, and it’s perfection in a can. This stuff was made for people like me who are super lazy about putting on body lotion. St. Ives’ is a light formula in a light spray with a faint, pleasant fragrance, and it practically applies itself! 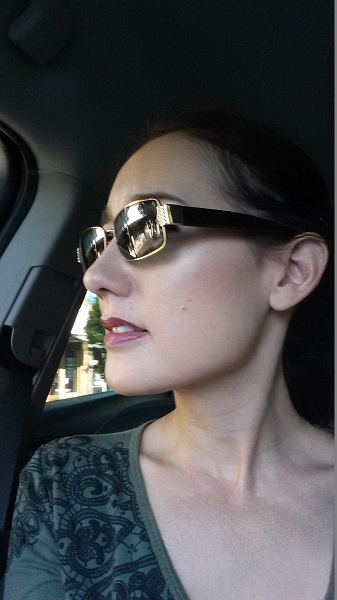 It’s delightfully effortless, and I really have no excuse to not moisturize, now. 8). 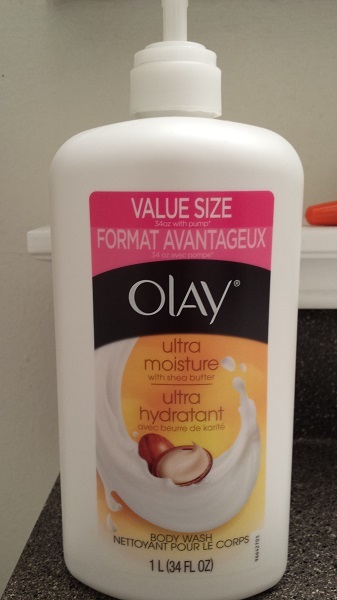 Olay Body Ultra Moisture Body Wash with Shea Butter. According to Callaghan, the “Format Avantageux” is complete Quebecois… the French wouldn’t say “value size” like that! It seems that all the French on the packaging of products in the States is Quebecois. Interesting. Here’s another wonder of a moisturizing product! We’ve actually been using this body wash since spring, and we’ve discovered that other moisturizing body washes just don’t compare. We keep coming back to this one; we re-purchased it again in July, so I thought I’d put it on the list. Oh, and by the way, that St. Ives lotion spray following a shower with this Olay body wash results in the silkiest skin ever. Great combination! 9). 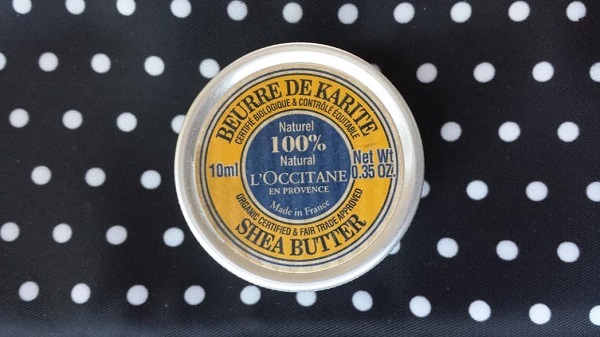 L’Occitane en Provence Beurre de Karite (Shea Butter) lip balm. L’Occitane en Provence shea butter lip balm… very simple, and very effective. L’Occitane en Provence was one of those little shops in the mall I always walked past and never entered; neither did I ever feel compelled to try their products when I lived in southern France, where the company originated and therefore has shops all over the place. Even after our friend Chantal gave me this little pot of lip balm, it took me a while to try it… she gave it to me in April, and I didn’t really start using it until June. In July, though, I found myself reaching for this product more and more as my lips became drier with the intensifying summer heat. This is a very effective all-purpose lip balm. Did I ever tell you about the time I lost my prescription sunglasses in France at a gas station somewhere between le Vercors and Nice? Well, that happened, and I’ve been driving illegally ever since… until now. Oh yes! Now cops can pull me over all day, and they’re never going to cite me for driving without corrective lenses. Ha!